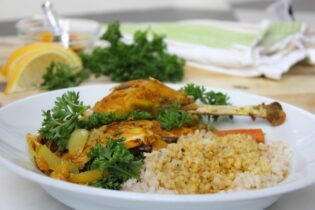 Always on the lookout for tasty new ways to work the anti-inflammatory miracle spice, turmeric, into my diet, this Slow Cooker Chicken Recipe is my latest creation…. It’s also a slow cooker dish that actually lives up to the slow cooker hype; dump all of the ingredients into the pot, hit the button and return several hours later to a perfectly cooked dinner. Although the vast majority of slow cooker meals won’t be very tasty if you don’t do a little prep work first (sauteing, pre-roasting, pre-searing, etc. 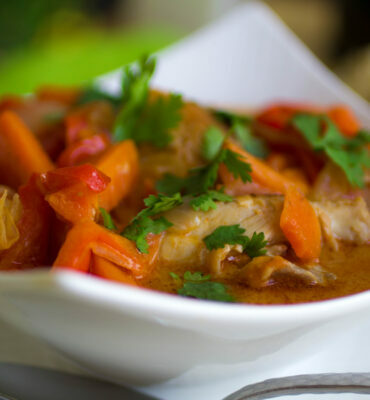 ), this Slow Cooker Chicken Recipe with Turmeric and Vegetables really is a set-it-and-forget-it tasty one dish wonder. It embodies the true spirit of slow cooking. If you have our Clean Cuisine book, you know we always recommend eating a pasture-raised chicken over free-range, organic, vegetarian-fed, etc. Not only are pasture-raised chickens healthier, they are also much tastier. Whether you are making my slow cooker chicken recipe or any other one, I can’t emphasize enough the importance of eating chickens that are pastured and fed the natural diet chickens are supposed to eat. The quality and nutritional value of the chicken you eat varies widely depending on what the chicken ate. The natural chicken diet is one that contains fresh pasture, worms and bugs (FYI: chickens are not supposed to be vegetarians!) If the chicken eats a deviant diet from what a wild chicken would eat then it won’t be as healthy, and neither will you if you eat it. A chicken allowed to consume a natural chicken diet has a more balanced ratio of omega-6 fat to omega-3 fat and the chickens themselves are leaner because they get to exercise. The eggs from pastured chickens are also healthier. Compared to commercial eggs, eggs from hens raised on pasture contain about 1/3 less cholesterol, less saturated fat, more vitamin A, more omega-3 fat, less omega-6 fat, more than twice the amount of vitamin E and considerably more beta carotene. One quick note about the parsley…you will want to add the parsley about 30 minutes before the chicken is done. If you add the parsley right from the beginning, you’ll just end up with a wilted, discolored parsley mess. To turn your Slow Cooker Chicken Recipe into a complete dinner, serve with a chopped side salad and steamed short grain brown rice (I use sprouted brown rice, such as Lundberg brand, whenever possible). And, I know I have said it a gillion times, but I can’t help but say it again; using a rice cooker is the absolute easiest way to cook rice and all other whole grains. In a small bowl, mix together the cumin, paprika, turmeric, cayenne pepper and salt. Add the honey and the juice from one whole lemon (reserving the lemon rind) and mix well. Using your hands, apply the turmeric spice mixture generously all over the inside and outside of the bird. Stuff the cavity of the chicken with half of the onions, half of the garlic and the reserved lemon rind. Place the remaining onions and garlic in the bottom of a 5 or 6-quart slow cooker. Add the carrots, bell pepper and crushed tomatoes. Season with salt to taste. Place the chicken on top of the vegetables. Cover and cook on low for 4 to 6 hours (Note: Cooking time will depend on the size of your chicken and slow cooker). Add the chopped parsley about 30 minutes before cooking time ends. Serve warm over steamed short grain brown rice. Crushed tomatoes can vary tremendously from brand to brand; to ensure the Slow Cooker Chicken recipe turns out properly, I recommend Muir Glen Organic Crushed Tomatoes with Basil. P.S. Looking for More Healthy Dinner Recipes? If you liked the Slow Cooker Chicken Recipe, be sure to check out a full month’s menu of delicious healthy dinner recipes (including weekly shopping lists!) in our Clean Cuisine Dinners digital cookbook. Looks great! I’ll be trying it soon. Thanks! This is now on my menu for next week. I tend to always do my slow cooker whole chicken the same with garlic, lemon, and onions…so this will be a great change of pace! Thanks!! Oh good! Thank you for letting me know Michelle =) We just did a workshop last night for Andy’s patients and one of the ladies said she made it and loved it—but she had never cooked with turmeric before and didn’t realize it would turn her hands yellow! The yellow will wash out but you might want to use thin cooking gloves when making it OR just put a lot of EVOO on your hands before you start cooking (that will make it easier for the turmeric to wash out) Please do let me know how you like it! Not a dumb question at all Stephanie! I should have specified—but yes, I mean a WHOLE chicken. I actually never get frozen chicken because they just don’t taste as good to me—but I buy a fresh, pasture-raised chicken from our local whole foods. I have also heard you can get great pasture-raised beef/ chicken/ etc. online from the Butcher Box (I have been meaning to order from them but just haven’t had time to try it out just yet.) Hope this helps? Is there a way to cut this recipe down? I am right now on my own until my husband returns from a deployment. And, when he returns its just the two of us. I can’t justify cooking a whole chicken, I guess unless its a small one. I feel that the leftovers here would be less versatile with the depth of these flavors. Does it have to be a whole bird or could I use a small pack of thighs or breasts? Hi Sandi, I definitely understand why you might want to cut the recipe down, but you are right, the bones and everything definitely contribute to the flavor of the dish. I would suggest getting the absolute smallest whole chicken you can find (and to be honest, the pasture raised ones I find are ALWAYS way smaller than the regular chickens) and then make the full recipe and eat what you can for the first 2 days or so and then portion out the rest and freeze it. You can then use the bones to make chicken broth on the 3rd day. Hope this helps? I love this recipe! Great flavors. Mine was a bit saucier than yours looked (not sure why) but it was quite delicious. I’m using the extra sauce with other things like swiss chard and veggies over polenta. I’m glad I tried it and will be making it again. This recipe was delicious and my kids (4.5 and 16 months) even loved it! I had some celery to use up, so I substituted 1 carrot with two celery stalks. Thanks! Oh so good to know Kimberly! And I am thrilled the kids ate it too =) Thank you for letting me know and for sharing what worked as a substitute. I just found you and this recipe today. I was on a serious time crunch so I just threw all the ingredients in a crock pot with 4 chicken breasts. It was amazing! The whole family loved it! Thank you!